Mayor Bill de Blasio, Speaker Corey Johnson, the City Council and advocates today joined a rally at Union Square Park celebrating the passage of for-hire vehicle legislation. Among other things, the package of legislation will set a minimum pay for drivers and mitigate congestion by placing a one-year pause on the number of for-hire vehicles app-based companies are able to have on New York City roads. “The City Council has taken a big step toward creating a fair and equitable framework for overseeing the for-hire vehicle industry in our city. FHV drivers should be able to support themselves and their families without working unhealthy hours, and they shouldn’t have to work longer and longer with each passing month because thousands of new cars are flooding the streets. I’m proud of this package of bills, and I am confident we will see meaningful change that benefits this city,” said City Council Speaker Corey Johnson. That he will be signing the legislation on Tuesday, August 14th, 2018. The City will stop issuing new for-hire licenses that same day, with the exception of wheelchair-accessible vehicles. The City will initiate a study to more comprehensively manage the changing industry to reduce congestion and protect workers by ensuring fair pay. The City will introduce and adopt a new minimum compensation rule at the Taxi and Limousine Commission within 75 days. Once adopted, it will increase for-hire vehicle driver take-home pay by approximately 20 percent on average – that’s more than $6,000 per year. “Yesterday was a historic day. The New York City Council led by Speaker Corey Johnson along with my For Hire Vehicle Committee passed some of the most comprehensive legislation halting app-based ride sharing services and initiating a study on their effect in NYC. This is the first legislation of its kind in the nation and it will stand as a template for other large cities facing issues with their taxi industry. Thank you to all my colleagues who were a part of this package of legislation and we will continue to work for a more fair & equitable New York City,” said Council Member Ruben Diaz, Sr., Chair of the Committee on For-Hire Vehicles, Sponsor of Intros. 634-B, 838-C, 958-A. “This victory belongs to yellow taxi, green cab, livery, black car, Uber and Lyft drivers who united together in our union to transform our shared struggle and heartbreak into hope and strength. 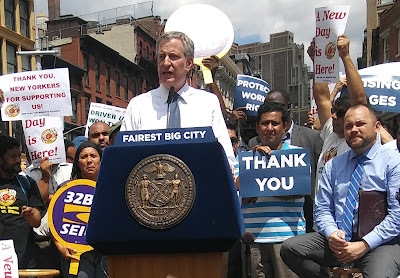 The legislation passed by City Council didn't just set a precedent for our city, it set a precedent for the entire world as companies like Uber and Lyft use technological innovation to return us to a time of sweated labor, destroying lives and livelihoods. Yesterday, we took the first step toward ending the crisis of poverty devastating New York City's professional drivers. 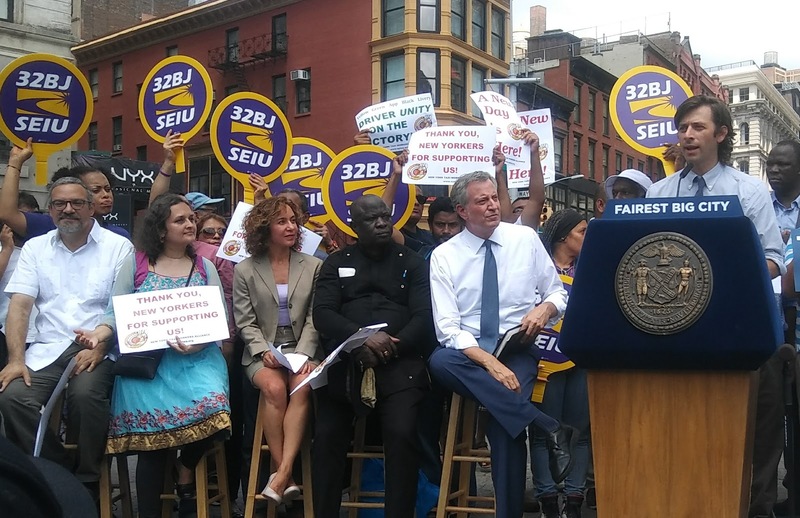 Tomorrow we will continue to fight,” said Bhairavi Desai, Executive Director of the New York Taxi Workers Alliance. “This victory shows the power that workers coming together in a common purpose, speaking out and supporting each other. This was possible because drivers from all sectors -- yellow, green and livery cabs, and those working for app-based companies -- joined together, organized and did not give up, even as many of them continued to drive long shifts to keep up. 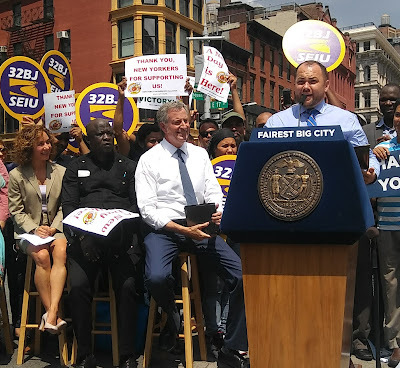 We will continue to support the Taxi Workers Alliance and all drivers as they seek a just system that will allow them to support their families and benefit their communities,” said Héctor J. Figueroa, President of 32BJ Service Employees International Union. We were in attendance at the above rally and press conference, but Councilman Ruben Diaz Sr. the Chair of the Committee on For Hire Vehicles was not in attendance. 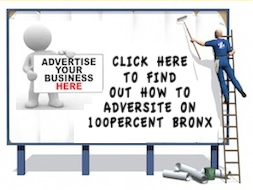 We do not know how Councilman Diaz Sr. can be quoted when he did not attend the rally/Press conference. Above - City Council Speaker Corey Johnson speaks on the issue. Below - City Council member Stephen Levin spoke along with Council member Ydanis Rodriguez. Council member Ruben Diaz Sr. the Chair of the For Hire Committee did not speak nor was he present.